Excitebike: Bun Bun Mario Battle Stadium (エキサイトバイク ぶんぶんマリオバトルスタジアム Ekisaitobaiku Bun Bun Mario Batoru Sutajiamu: noting that "bun bun" is a Japanese onomatopoeia for buzzing sounds - in this case, produced by the motorcycles - this title can also be understood as simply "Excitebike: Mario Battle Stadium") is a remake/adaptation of the NES title, Excitebike. 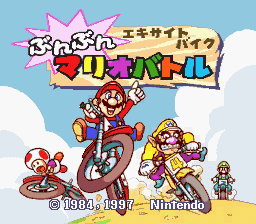 In this game, all human motorcyclists were replaced with Mario characters. As a Satellaview title, Nintendo developed the video game and released four versions of it through the satellite download service operated by St.GIGA, each expanding on or replacing the features of the last. There are four different episodes of the game, each adding a new character. Episode 1 featured Mario, Luigi, and Toad. Episode 3 added Princess Peach. Episode 4 added Yoshi and removed Luigi. Playable character list from Version 3. 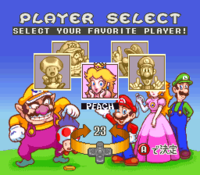 There are six main characters: Mario, Luigi, Peach, Toad, Wario, and Yoshi. Red and Green Koopa Troopas appear as non-playable opponents. Wario appears as a non-playable opponent as well in Episode 1, but is playable in all subsequent episodes. Like many other Satellaview games, Excitebike was released in four installments. The likely time of broadcast was 7PM. The program may have re-aired various times, but exactly when or how many times is uncertain. Magazine article previewing the game. This page was last edited on October 11, 2018, at 16:13.